Britten: Choral Music – BBC Music Magazine - These are sprightly and well-directed performances. The Vasari Singers run a swift and sure course through this whistlestop tour of Britten’s vast choral output. The Ceremony of Carols, although written for treble voices, enjoys pureness of tone and rhythmic incisiveness from the ladies of the chorus, although here, as in the rest of the CD, it is difficult to hear the words. Margaret Crossland handles the solo ‘That yongë child’ with commendable sensitivity. For the ladies, the recording quality falls just short of being excellent. It lacks breadth and transparency, a fault that is put right when the rest of the choir joins in for the Hymn to St Cecilia and Sacred and Profane. These are sprightly and well-directed performances, but by the time we get to the last item on the disc, the a cappella voices are starting to sound a bit too delicate and whimsical. So the comparatively robust nature of Rejoice in the Lamb introduces a welcome note of extravagance. Here there is a substantial part for organ and the recording engineers can be justly proud of a fine balance. The packaging is rather stingy. It seems a false economy not to include the texts; nor are we told anything about the Vasari Singers. The timings of the bands have got hopelessly muddled, and the organist is not credited. 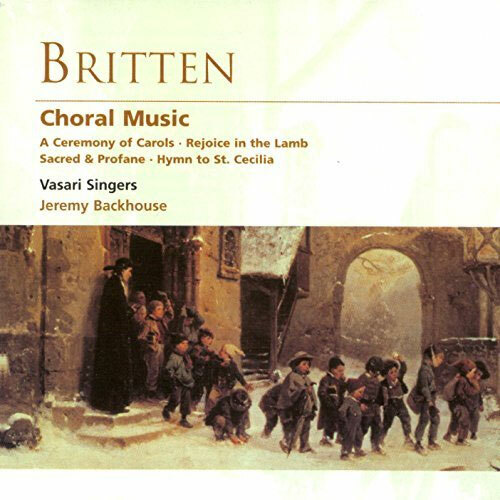 Britten: Choral Music – Gramophone - Jeremy Backhouse’s firm, clear direction pays handsome dividends. Jeremy Backhouse’s firm, clear direction pays handsome dividends and the flawless ensemble and perfect tonal blend he achieves from his singers results in a fine account of Rejoice in the Lamb. Particularly impressive is the extraordinarily compelling effect achieved through some outstanding dynamic control. This new release distinguishes itself with a first-rate performance of the little-heard late (1974) work Sacred and Profane.